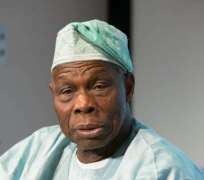 Former president, Chief Olusegun Obasanjo has reacted to the victory of the Osun State Peoples Democratic Party, PDP, and its governorship candidate, Senator Ademola Adeleke, at the Election Petition Tribunal. The State’s Election Tribunal on Friday sacked Gboyega Oyetola of the All Progressives Congress, APC, and declared Adeleke as winner of the 2018 governorship election. Reacting, Obasanjo, in a statement he personally signed on Saturday, commended Adeleke for going to court to seek justice. He also criticized those discouraging the Presidential Candidate of the Peoples Democratic Party, PDP, Alhaji Atiku Abubakar, from going to seek redress in court, saying they are of evil mind. The statement reads, “While I was in Dubai to attend the Global Education and Skills Forum meeting, I received the news of the judgment of the Osun State Governorship Election Petition Tribunal declaring Senator Ademola Adeleke, the candidate of the People’s Democratic Party (PDP), the winner of the 2018 Governorship election in the state. “While I have refrained from commenting on the 2019 elections because one of the parties has gone to court, may I point out that those who call themselves our development partners and friends and preach sacrificing justice on the altar of so-called stability are enemies of justice, democracy and Nigeria. “We will continue to sustain Nigeria in stability and unity on the altar of justice, equity, fairness, freedom, human rights and democracy. Stability cannot be successfully built on injustice, corruption, inequity, and divided nation, and incompetence, nepotism and one-sidedness. Nigeria will march forward with or without those who will want to feed us with diet of values and actions that are not acceptable in their own countries. “Nigeria is of age. And if Buhari could go to court three times to seek justice, even without reasonable cause, any Nigerian who feels denied of justice must feel free to go to court. “Those who have conceived and are promoting the narrative that if Atiku Abubakar continues to seek legal redress there will be violence, are evil minds looking for excuse to unleash violence on Nigerians. At no time in history has sustainable peace been built on theft, injustice, corruption and inequity. “These merchants of chaos and violence should have no place in any decent society. And they must know that no intimidation or prophesy of violence and doomsday will cow anybody. Nigeria belongs to all Nigerians. We will respect as friends those who believe that what is good for their country should be good for Nigeria.